“Yoga teaches us to cure what need not to be endured and endure what cannot be cured” -B.K.S. Iyengar founder of Iyengar yoga.To keep up with the pace and be updated in this modern day we have almost forgotten to take care of ourselves and indulge more and more nutrient-poor modern day diet. As a result of which we are becoming weaker day by day and get prone to various types of diseases at a very young age. People need to make sometimes for exercises or yoga to keep themse3lves fit and free from various harmful diseases. Yoga is the best way by which one can actually keep them fit. There is no age bar for performing the yoga; any one of any age can perform it. Here are some excellent yoga poses which you can perform which will help you to build your body strength. One of the best and common forms of yoga poses. Stand straight with your abs tight and shoulder back. Step back by keeping your left leg wide as much as you can. Put the right leg in perpendicular position and the thighs parallel to the ground. Lift your arms straight up in the air and open your chest by slightly bending backwards. Stay in the position for 30 secs and then repeat for the other leg. Balance your head carefully by placing it upside down so that the heart is above the head and take at least 5-10 long breath. This yoga pose will help you in stimulating the digestive organs and the circulatory system and will also strengthen the musculoskeletal system. Utkatsana is one of the best yoga poses which is effective for thighs, abs and butts. Sit down in a chair position with your hands together near your chest as if praying and twist left side and try to touch the your right elbow. Come back to your original position and twist the other side. The yoga pose will help to strengthen your thighs and tone your muscles. One of the best yoga to perform is the Uttihita Chaturanga Dandasana or simply the high plank pose. The yoga pose is very much effective for wrists, shoulder and your legs. Lie down with your head upside down. Keep your legs straight and your arms in a perpendicular position. Raise your body in air. Put pressure in your arms resting in the floor and your toes. Your body should be in a straight line. Slowly raise your hips upwards. Stay in this position of 5 secs and return back to your original position. 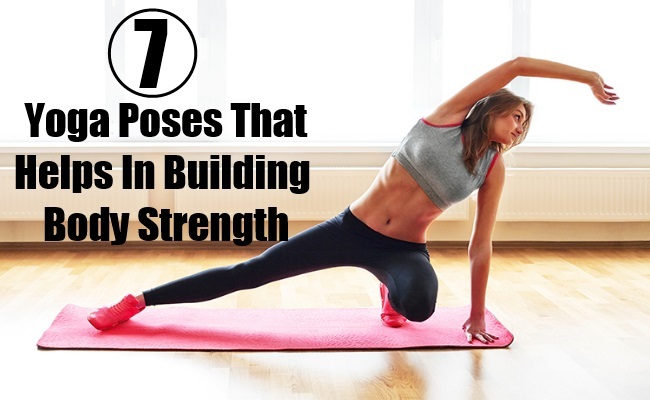 This is one of the best pose to increase your body strength. A very delicate yoga position and hence should be taken out most care while performing the yoga. Lie down on your back and try to bring your knees upto your chest and slowly put your legs in the air by supporting your back with your arms and take deep breath and slowly lower down your legs. One has to care proper care by balancing your legs, knee and your back in a proper way. The yoga normalizes the body weight, helps in increasing the body strength and also performs detoxification naturally. Lie down with your arms on your side and palm down and then try to push your hip up slowly in the air by keeping your thigh and feet at a parallel position. Stay as it is for 20-30 secs and then relax by coming back to your original position. The yoga pose will help to strengthen the legs, open up your shoulder and chest and also helps in increasing the body strength. Make yourself easy and allow your head to fall below your heart and keep your both hand resting on the yoga mat. The forward bend of the body squeezes your belly and helps in proper digestion, strengthen your muscles, inner and back legs and spines. This entry was posted in Featured, Goals, Improve Endurance, Increase Energy. Bookmark the permalink.